Marvel.com recently spoke to Editors Mark Paniccia and Daniel Ketchum as they prepare the Children of the Atom for ResurrXion! You asked for it—and you’re going to get it. After years in the darkness, the X-Men step back into a colorful tomorrow. Coming in Spring 2017, the X-Men family of titles regroups with a diverse line-up of ongoing series including CABLE, GENERATION X, ICEMAN, JEAN GREY, and WEAPON X. Leading the ResurrXion will be two new flagships: X-MEN BLUE and X-MEN GOLD. While exact details on this upcoming initiative remain scarce, we spoke with editors Mark Paniccia and Daniel Ketchum about the heart of the X-Men, why this shift should please longtime fans, and much more. Marvel.com: What is the mission statement of ResurrXion? Mark Paniccia: Easy. X-Men are heroes. Of the Marvel Universe. These mutants have saved the world enough times they deserve to be called what they are. Daniel Ketchum: Without spoiling too much about the ending of INHUMANS VS X-MEN, the X-Men have been living with a cloud hanging over their heads—literally. The current roster of X-Men titles has been defined by this pervading sense of doom, the fact that mutantkind is on the brink. Well, one way or another, the impending threat of extinction subsides, and this is the story of what happens next. The X-Men have a future. Now what are they going to do with it? Marvel.com: What are the most important elements of the X-Men books that will be present in ResurrXion? Mark Paniccia: The same stuff that made these stories and characters we love so much stand out time and time again. Crazy cool adventures. Awesome super powers. Groundbreaking science fiction and heartbreaking romance. And the element of surprise. When I was first introduced to the X-Men as a reader back in the [Chris] Claremont/[John] Byrne days I was always on the edge of my seat. I want readers to feel like they are on that same emotional roller coaster that made me come back month after month. I want to tap into that same creative energy that had us feeling what the characters were feeling, rooting for your heroes and cheering them on during battles where you thought they had no chance. And those quiet moments that made you smile because they were so real and relatable. I can’t tell you how excited I am about this line and the stories we’re going to be telling. Daniel Ketchum: Extinction is no longer staring them in the face, so the X-Men can exhale and turn their attention back to doing what’s defined them since the beginning: Protecting a world that hates and fears them. These new titles won’t cast the X-Men as members of a species fighting for their survival but rather as big, bright, colorful super heroes who want to demonstrate to the world that they want to walk with them hand-in-hand into the future. They’ll have costumes with capes, a school, and softball games. Oh, there will be softball games. The goal is to tell exciting new X-Men stories while keeping an eye on the tropes and touchstones that longtime X-Men fans cherish. Marvel.com: Why give solo books to Iceman and Jean Grey? Mark Paniccia: These are characters rich with stories to tell. And characters readers want to read about. We’ve given a lot of face time to other characters and felt it was time to put the spotlight on two of these beloved cast members. Daniel Ketchum: Because it’s about time, isn’t it? Jeff Lemire wisely identified that there’s much story to be told when it comes to both Iceman and Jean Grey, which is why he included them in EXTRAORDINARY X-MEN. But one of the pitfalls of writing a team book is that you can really only spend so much time with any one member of the cast. So while we did get hints of larger stories, we didn’t really get to delve deep with either one of these characters. Doing solo series will give writers and readers that opportunity. Marvel.com: What can we expect from the new books with old names, GENERATION X and WEAPON X? Mark Paniccia: With GENERATION X we’re tapping into the demand for the school book. The school is such a big part of the X-Men mythos it feels wrong not to have a series devoted to it for this long. And I think readers will like the cast and the creative team. This will be a book that will seem familiar but it’s going to have a very fresh vibe to it and I can see it being a very endearing run for fans of this kind of book. Daniel Ketchum: GENERATION X and WEAPON X follow in the footsteps of their predecessors in terms of tone and spirit, but otherwise they blaze their own trails. So, GENERATION X will bring you plenty of teenage drama, school uniforms, awkward kissing, and young X-Men being thrown into peril that would test the mettle of even the most seasoned veterans. And—of course—Jubilee. Because how could you do a GENERATION X book without Jubilee? Marvel.com: How will the flagship Blue and Gold books appeal to X-Men fans? 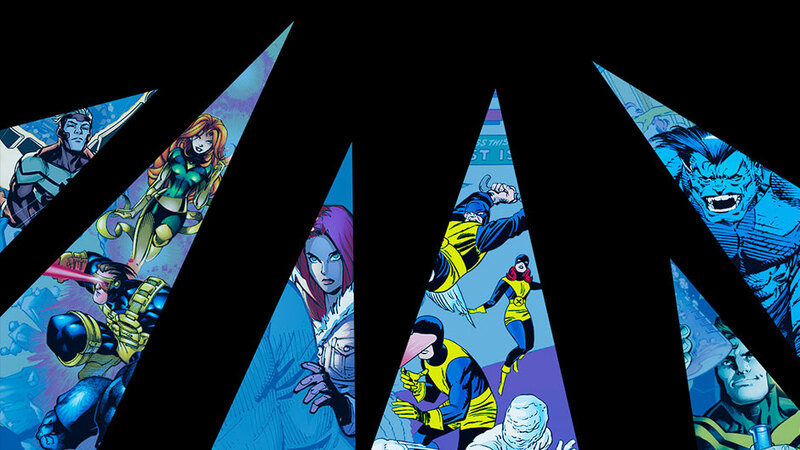 Mark Paniccia: These are the return to the quintessential X-Men team books. Rosters you’re going to love. The kinds of stories we all grew up on. You’re going to dig them and maybe even feel a little competition between the books, trying to outdo each other. If I do my job right, there will be readers who are Team Blue or Team Gold. Don’t get me wrong. You’ll enjoy both but you will have a home team. Daniel Ketchum: Let’s not skip over the fact that we titled these books X-MEN BLUE and X-MEN GOLD! From the top down, we conceptualized these series as our love letters to the characters and stories that made us the stalwart X-Men fans we are today. Both books boast all-star lineups and the adventures they embark upon are fitting of their statures. These are the classic heavy-hitter X-Men, doing what they do best. Marvel.com: How were the creators working on ResurrXion selected? Mark Paniccia: It wasn’t easy. There are lots of great creators with great X-Men stories to tell. All I can say is that everyone involved has a particular love for the X-Men, a passion that’s only rivaled by my editorial team. With that kind of energy behind the books I can tell you these are going to be some amazing runs and I couldn’t be prouder of the lineup of talent we have. Daniel Ketchum: Well, Mark wanted to put a bunch of pictures on the wall and throw darts, but I thought that might give people the wrong idea. So instead we just reached out to creators we love, who we knew had X-Men stories to tell. Some are creators readers are familiar with and others are new voices we’re bringing to into the mix. What else can you tease about this initiative? If I say, “A beloved X-Man returns and will lead the X-Men into the future,” who will readers think I’m talking about? Who is Andre Mexer, again? Let’s be honest: Katya and Tatianna were the real winners of All-Stars 2. It’s always the Phoenix. Always. Stay tuned to Earth 7269 and our social channels for the latest updates on ResurrXion as we count the days to Spring 2017!